Not long to go now before the big fat man in the bright red suit pays a visit! Thought I would share a couple of photos from our weekend away last weekend. Here we are about to board the Kookaburra Queen Paddle Steamer for dinner. On board. Story Bridge in background. I made Clem take his party hat off for the photo. hehe. 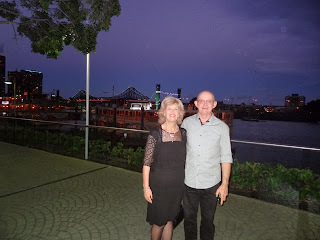 We cruised up and down the Brisbane River while being treated to a delicious smorgasboard dinner and live music. Thought you would like to see a couple more cards I made for Christmas. This first one was taken from Pinterest. I loved this design for its simplicity and elegance. I made it in Crumbcake and in Soft Sky. Vellum stamped and embossed with white Craft Ink in the lovely Poinsettia flower. A bit of ribbon and pearls and you are done. Hello Everyone, Today I wanted to share some things from my Downline Christmas get-together last week.. I have a wonderful Downline Team. We really do support each other and love sharing our ideas. Not all my Team are "Business" Demonstrators either. Some of them are just "Hobby" Demonstrators. Some just do classes and some just share with friends. 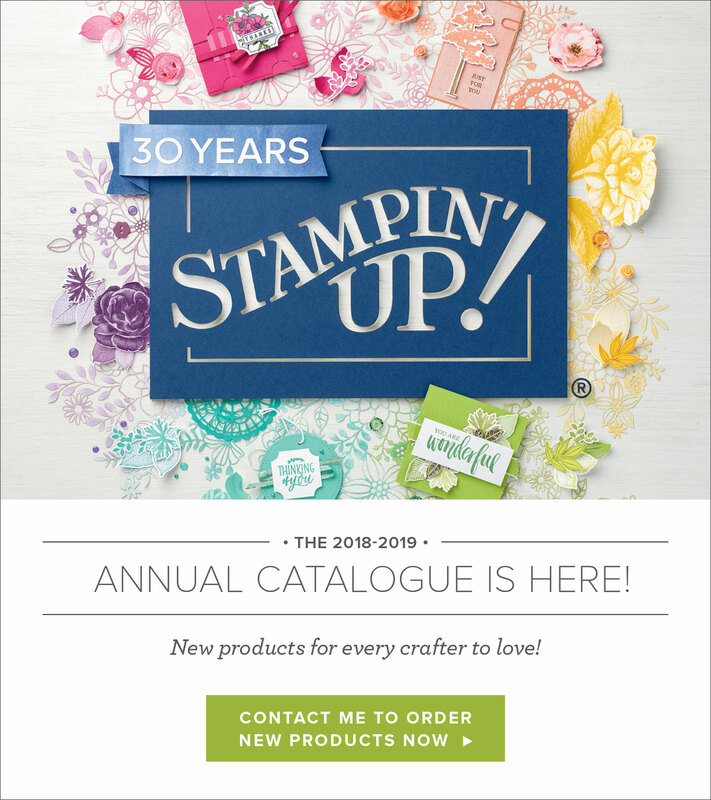 But we are all Stampin Up Demonstrators. At Convention this year I saw a some great teams with very clever names and I felt compelled that our little group would have an appropriate moniker as well. 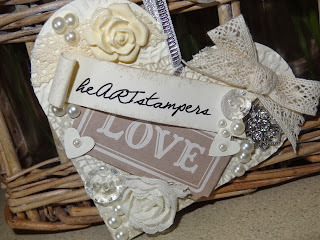 "heARTstampers" popped into my head and wouldn't go away. So that is our Team name. It is very appropriate I think. We stamp with heart. No doubt about it, and our love for our art is at the centre of it. For our Christmas get-together this year I wanted to give my downlines little "heart" gifts. Have you seen the marvellous Card in a Box? I fell in love with it the moment I saw it and just had to make one for my final Christmas Class. I have Cased mine from Monica. Who has a great video tutorial. This is how it sits - folded flat so it is easy to post. And then this is how it opens out. Isn't this lovely. 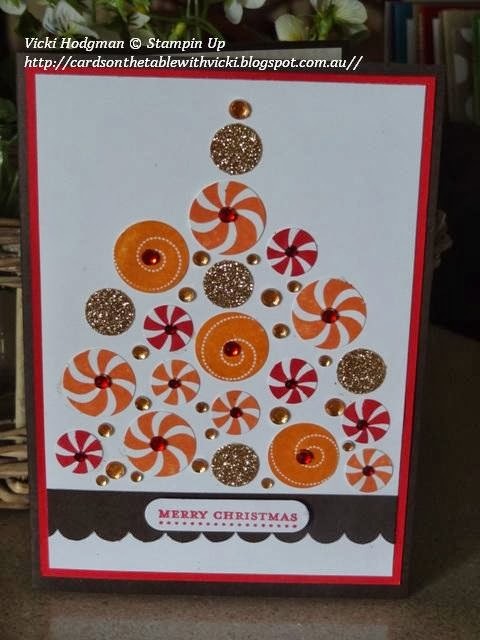 My cardstock base is Chocolate Chip and I have used the Season of Style Designer Paper. With all those lovely festive flurry snowflakes popping out of the box in cherry cobbler, brown sugar and champagne glimmer card. This is how it looks from inside, upside down. You can see the two attached cardstock pieces that the festive flurries are attached to. You may be wondering where you can write on a card like this? Well turn it round and on the back is plenty of space to write a heartfelt greeting. The other project for our final class was an elf bag which I modified slightly from a design originally by Kirsteen Gill. She is so clever. Hello everyone, how is the Christmas shopping going? Do you have all your presents sorted yet? I still have the main presents to get but all the small handmade ones are done. Phew. I had quite a few little gifts and thankyous to make this year and I couldn't go past the lovely dress up framelits to help me along. 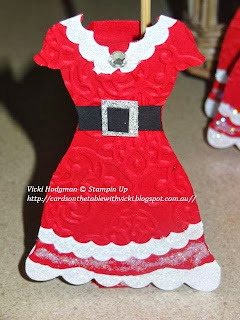 What do you think of my Mrs. Claus dress? The scallops are made using the Scallop oval Punch. Punch once then punch a second time close to the original to get a little scalloped edge piece like this. I cut one in half for the collar. White scallops on the bottom of the dress are from the other dress framelit. And here is the greeting I stuck into the little box attached to the back of the dress. I just used a wooden skewer cut down. The postage stamp punch and a computer generated greeting on whisper white. The back view. I have attached the skewer with some washi tape. Gotta love that stuff. What did I put in the little box - Lip gloss of course!!! A Very Orange and Purple Christmas and other unusual cards. Hello Happy Stampers. Do you make special cards for your friends? I have two good friends- one loves purple and one loves orange. How to incorporate these colours into Christmas Cards? (speaking as a very Traditional Red and Green Christmas Girl). I think I have cracked the problem! I saw this idea on Pinterest where a clever lady used circles to make a Christmas Tree. I can do that!!! Isn't this great! I used Real red as my contrast colour with Tangerine Tango and Pumpkin Pie. Card base is Early Expresso. Here is the Purple card. This time the colours used were Perfect Plum and Wisteria Wonder with Real Red again. Card base is Elegant Eggplant. 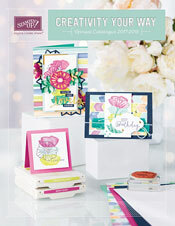 I used the Sweets for the Sweet Stamp set p. 18 of the main catalogue. 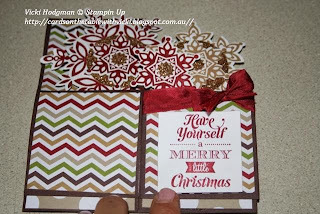 Plus some champagne glimmer card and diamantes in red and purple and red and orange, coloured with a Sharpie. I loved the way these cards turned out and hope the special recipients did too. Now for something completely different but I love it just the same. This is the second installment of last weekend's Workshop. 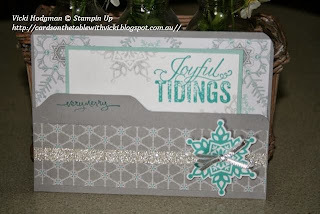 At the workshop I showcased the Festive Flurry Stamp Set and Framelits (which I showed you in the previous post) and the Envelope Punch Board. This is the card everyone made using the Envelope Punch Board. This is a File Folder Card. You make the tab on the card and round the corners with the Envelope Punch Board. The section in the middle pops out and you can write your greeting on it. I also suggested you could place money or a gift card inside as well. Ink: Smoky Slate and Bermuda Bay. Here is another File Folder Card I showed everyone. This time made as regular card. See I have made tabs on the front and back of the card this time.